College Ring-In 2017 – Details Here! The registration fee is $98 and includes lunch on Thursday, Friday, and Saturday, and an event t-shirt. 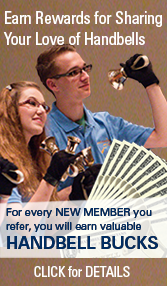 Members of Handbell Musicians of America receive a $15 discount. Complete the online registration form by following the link below. Members, be sure to log in to your member account before registering to get the member discount. You are responsible for purchasing all the repertoire and rehearsing it prior to arriving at the event. 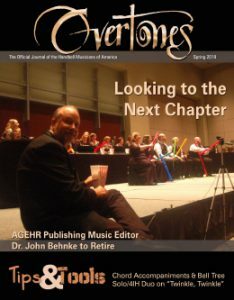 Music can be purchased from any of our handbell retailers or direct from the publisher. Special arrangements are being made for some titles. Details on how to obtain those pieces will be added when available. When you check out, use the coupon code CR17. That will allow you to buy a single copy for $4.00. You will need to print this out. Purchase a downloadable PDF here. *Available after November 23, 2016; you can pre-order and it will be sent to you when it’s available. Our official hotel for this event is the Springhill Suites Dallas NW located a short drive away from Lovers Lane United Methodist Church. Springhill Suites provides a free shuttle from Love Field Airport, free hot and cold breakfast each morning, and high-speed internet access from your room. Our group rate is $109/night plus tax for up to 4 guests per room. Book your room using this link. The deadline for reserving your room to guarantee our group rate is Friday, December 16. Do you have a composition or arrangement you would like to hear played? Submit for inclusion in the unpublished music reading session. Just indicate that you wish to participate in the session during the registration process and event organizers will contact you with more details. You should be prepared to provide enough printed copies of your arrangement for event participants to ring. Plus, we’ve arranged for industry publishers and editors to be at the reading session to provide advice and guidance about copyright permissions and the publishing process. They can also provide valuable input and suggestions for improving your arrangement or composition.